This is the Best Chip Dip Recipe for the big Game Day because it’s so versatile! Only 3 ingredients and you have a light, herbed chip dip that pairs well with every chip. 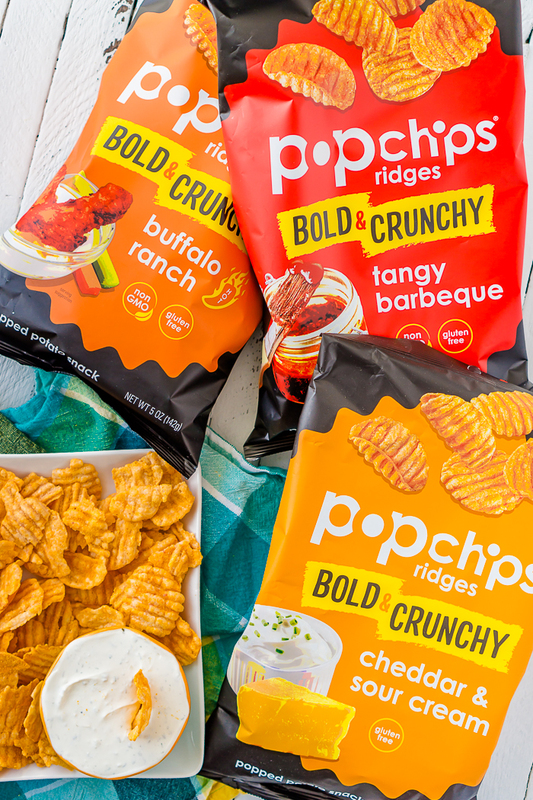 Especially with popchips’ bold flavors like buffalo ranch, tangy barbecue, and cheddar & sour cream! A Tasty, Universal 3 Ingredient Chip Dip You’ll Love! Do you have your plans settled for the Big Game? Do you have big traditions with family or friends coming over or are you getting cozy on the couch in your pjs? Both are sounding really appealing right now and both are good excuses for making this super easy 3 ingredient chip dip recipe! Just 3 ingredients gives you a light, herbed chip dip recipe that goes well with any potato chip … except maybe vinegar chips. I’m not sure I would want to eat this chip dip with salt and vinegar. It does go especially well with popchips ridges! They make the perfect game day snack as they are a great-tasting, crunchy, better-for-you option that won’t leave you feeling greasy or guilty. 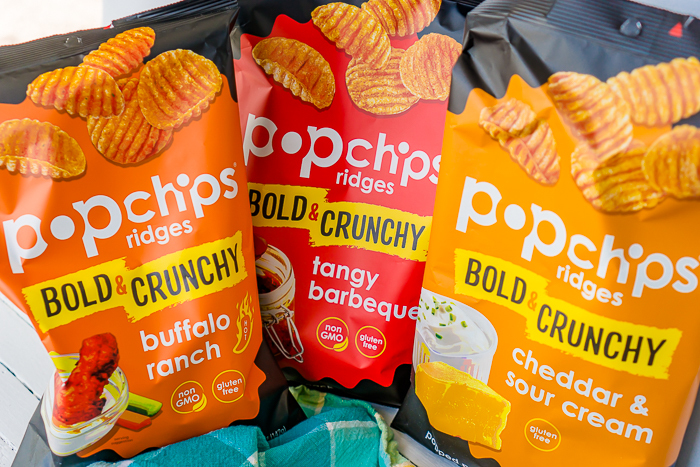 Plus, with all the extra unhealthy food that tends to consume game day menus, popchips is an easy way to lighten up the spread a little bit without sacrificing the flavor or crunch! Popchips are never fried, are 130 calories or less per serving, and contain all real ingredients while also being gluten-free and kosher. Win win! They actually just refreshed the ridges line, too, giving them an even bigger crunch and bolder flavor! It’s a sturdy chip perfect for game day dipping! My favorite popchips flavors to pair with this 3 ingredient chip dip? Buffalo ranch, tangy barbecue, and cheddar & sour cream. They are the perfect chip to pair with a light chip dip filled with herbs like dill, garlic, chives, and parsley. Buffalo Ranch Ridges are perfect for game day because you get the great flavor of eating buffalo wings without the mess. Your taste buds will be thanking you a swell as your sauce free fingers, especially paired with this herbed chip dip! Cheddar & Sour Cream Ridges combines sharp cheddar, smooth sour cream and potatoes. It’s basically the perfect trifecta. My son could not get enough of these chips with the dip! Lastly, Tangy Barbeque Ridges are a tasty sweet and smoky combo with a touch of spice. They taste like they are straight off the grill! So enjoy the irresistible taste of true BBQ with no sauce left on your fingers and dip into this 3 ingredient chip dip for the perfect pairing. Make sure to pick them up at your local grocery store or place your order on Amazon today! While I love how versatile this chip dip recipe is, making it one of my favorites, the best part of this dip recipe is how easy it is to make. Honestly. You just need to whip together 3 ingredients! Set out your chive and onion cream cheese on the counter for a little while before you are ready to whip the dip up. It’s easy to work with cream cheese that is closer to room temperature than straight out of the fridge. Then, combine cream cheese with sour cream and dry ranch seasoning. You can mix by hand but I find it easier to blend them together using my hand mixer. Using a chive and onion cream cheese or herbed cream cheese is key to making this dip. 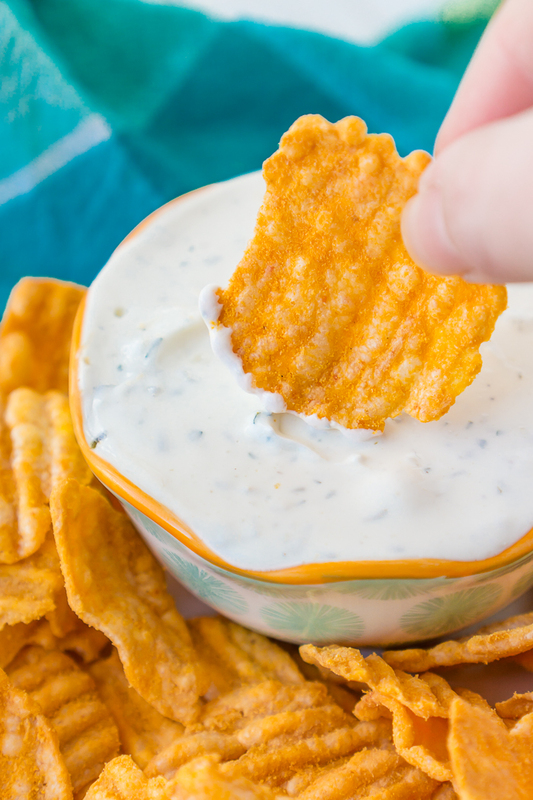 If you use plain cream cheese, you are just making a very subtle ranch dip. The combination of the chive and onion cream cheese with the ranch seasoning, which includes dill, garlic, chives, parsley and more, make this flavorful herbed chip dip! 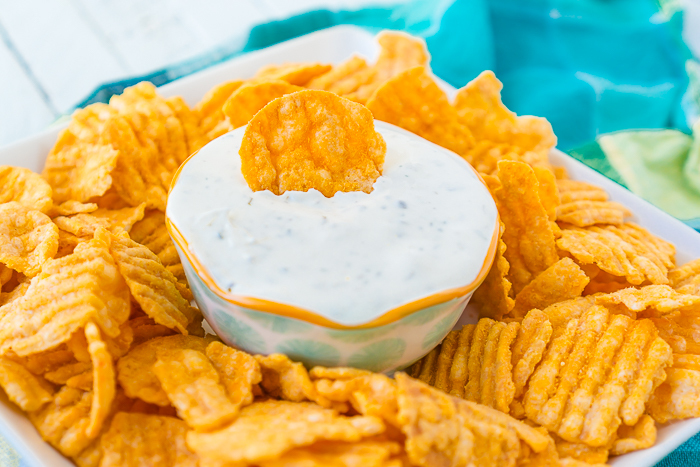 NOW, LET’S WHIP UP THIS SUPER EASY 3 INGREDIENT CHIP DIP RECIPE! The Best Chip Dip Recipe - only 3 ingredients to a light, herbed dip that pairs well with ANY chip! Mix together all 3 ingredients until well combined. Put in fridge when done until you are ready to enjoy! ***This is easier to do if you let cream cheese sit on counter first for awhile to be brought closer to room temperature. Galentine’s Day Gift Bags with FREE Printable!